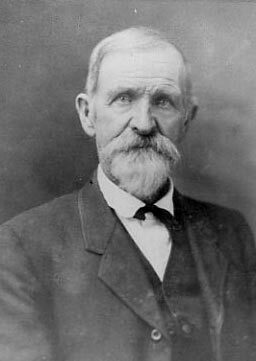 Merritt M. Lewis (pictured here at age seventy-five) was born in Darke County, Ohio on March 12, 1839. His parents were Samuel and Susan (Wise) Lewis. Merritt was the fourth of eight sons. In 1841, the family resettled to Indiana. Merritt's father died in Indiana around 1850; Merritt worked as a farm laborer and moved on west to Illinois, settling in Vermilion County. Civil War Career. Merritt noted in his own Notes of Important Events that he enlisted on November 14, 1861. He signed up in his local community, Blue Grass, Vermilion County, Illinois. Two days later he arrived at Camp Douglas to join other enlistees who were in training there with the Fifty-First Illinois. Lewis seems to have been one of the healthiest members of the regiment: throughout the regiment's movements through Missouri, Tennessee, Mississippi, Alabama, and Georgia in 1862 and 1863, there is no record of his having been absent from the regiment on account of illness. In mid-1863, he was promoted to the rank of corporal. In December 1863, Lewis reenlisted along with many other men of the regiment, committing himself to another three years with the regiment, should the war last that long. In early 1864, he was promoted to sergeant; in 1865, to first sergeant. Merritt served with the regiment until its final muster-out in Texas in September, 1865. Merritt married Mary Jane Copeland (born Ohio, 1849) in Bethany on May 5, 1867. The Historical Record of Harrison County, Missouri recorded that Merritt "engaged in farming and stock-raising very successfully. He owns a fine farm of 240 acres in Bethany Township, located one mile south of the town, in which he resides, and also is the owner of other valuable farming land, and several pieces of good town property" (p. 566). Merritt and Mary Jane had three sons—Charles, John, and Bert—and two daughters, Grace and Minnie. (Minnie died in 1886 at the age of 4 [buried, Miriam Cemetery]; the other four children lived into the 1940s, 50s, and 60s.) In 1907, Merritt and Mary Jane left behind their forty years of life in Bethany and moved to Carthage, Missouri in the southwest corner of the state. In Carthage, Merritt was retired from active farming. 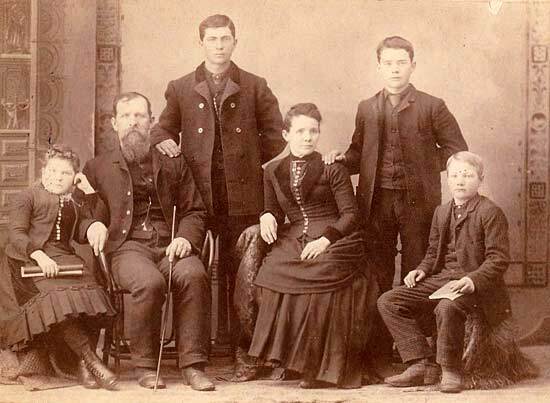 ABOVE: The Lewis Family from left to right: Grace, Merritt, Charles, Mary Jane, John, and Bert. The picture was taken in about 1887 in Bethany, Harrison County, Missouri where Merritt lived for forty years before moving to Carthage, Missouri. 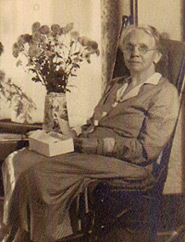 RIGHT: Mary Jane Copeland Lewis on her eightieth birthday, Carthage, Missouri, where she lived from 1907 until her death in 1938. Merritt died on May 11, 1914 and was buried in Park Cemetery in Carthage. Mary Jane died on December 23, 1938. The obituary immediately below appeared in The Carthage Press on May 12, 1914. Merritt Lewis, 75, Succumbs to Blood Poisoning—Sick a Week. Merritt Lewis, 75 years old, died at 4 o'clock yesterday afternoon at the Lewis home, 714 Olive street. Blood poisoning caused his death. He had been sick about a week. Mr Lewis had lived in Carthage seven years, having moved here from Harrison county, Missouri, where he was a farmer. He had been retired from active business since coming here. He was born and reared in Dark county, Ohio. He was a Union soldier throughout the Civil war, having enlisted in Company E Fifty First Illinois Volunteers at the first call for volunteers. He was in the battle of Lookout Mountain, Chickamauga, Chattanooga and other important engagements. He received honorable recognition for bravery from the government for capturing a confederate flag. He is survived by the wife, three sons, Charles H. Lewis, of Wichita, Kans. ; J. C. Lewis, of Kansas City; Bert B. Lewis, residing near Carthage; and one daughter, Mr. O. E. Proctor, who with her husband resides at the Lewis home here. Mrs. Lewis and all the sons and the daughter were at Mr. Lewis' bedside at the time of his death. Mrs. Charles Lewis and her daughter, Miss Mary Lewis, and Mrs. Bert V. Lewis and her two sons were also present. Mr. Lewis was a member of the Masons and the G. A. R. The body will lie in state at the Lewis home from 9 to 11 o'clock tomorrow morning. Funeral services will be conducted at 2:30 o'clock tomorrow afternoon at the home. Rev. Dr. W. G. Clinton, paster of the First M. E. church, will conduct the rites. Burial will be in Park cemetery. A Confederate Connection: Merritt's youngest son, Bert V. Lewis, investigated land purchase and business opportunities in Alabama in the early 1900s. He met his future wife Anna Laurie Williamson of Isney, Alabama there. They were married on November 22, 1905 in Waynesboro, Mississippi. Bert and Anna settled in Carthage, Missouri. Anna's father John Williamson had been a Confederate soldier—a member of the Twenty-Fourth Battalion, Mississippi Cavalry. Her father's brother Charles F. Williamson was a member of the Confederate Army and was killed in the fighting at Resaca, Georgia in 1864 where the Fifty-First Illinois and Merritt Lewis were across the lines. Many thanks to Charla Lewis Boodry, great-granddaughter of Merritt Lewis, for the photographs, family information, and the typescript of Merritt's Notes of Important Events. Bert and Anna Lewis had two sons, Ralph Wayne Lewis and Charles Gaston Lewis. Charla Boodry is Charles' daughter. Merritt and Mary Jane Lewis' oldest son was Charles H. Lewis. His wife was Olive Stewart, a native of Iowa. The family moved from Missouri to California. Merritt's original Civil War journal was handed down and preserved by the children, grandchildren and great-grandchildren of Charles H. Lewis' lineage. Thanks to the Carthage Library, Carthage, Missouri for copy of the obituary. Merritt Lewis, Compiled Service Record, Records of the Adjutant General's Office, 1780's-1917, Record Group 94, National Archives and Records Administration, Washington, D.C.
Death certificate, Missouri State Board of Health, Bureau of Vital Statistics. Missouri State Archives, Missouri Death Certificates, 1910 � 1957: http://www.sos.mo.gov/archives/resources/deathcertificates/. (1880 Census, Bethany Township, Harrison County, Missouri; 1870: Merit Louis).